The Ekonomik Yaklasim (EY) journal publishes research articles in the fields of all major fields of economics and other social sciences for contributing to the international social sciences literature. Ekonomik Yaklasim also aims to promote interdisciplinary studies over the issues of theoretical, practical, and historical importance in dealing with problems in economics. Published four times a year in February, May, August, and November; the journal is the official publication of the Ekonomik Yaklasim Association. 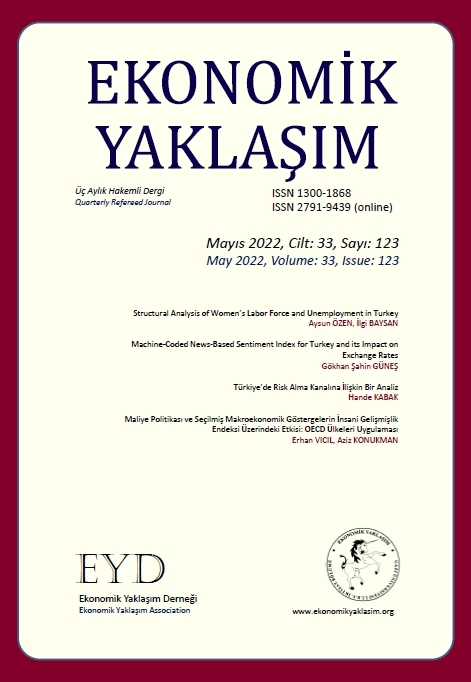 Ekonomik Yaklasim (EY) is a double blind peer-reviewed journal that employs economics to analyze issues in business, consumer behavior, public policy, history and politics. The Journal is focused on publishing both theoretical and empirical papers in economics. It is open for orthodox but also unorthodox approaches. The primary criteria for selecting papers are quality and importance for the field. Manuscripts submitted to Ekonomik Yaklasim should contain original research that have neither been published nor sent for review to any type of publication. The contents of each article are the exclusive responsibility of the authors.The journal's acceptance rate is 62%. Ekonomik Yaklasim welcomes not only Turkish authors, but also authors from all over the world. Papers may be written in English or Turkish. The decision to submit in either English or Turkish does not affect the outcome of the review process or the chance that the article is accepted. Authors with a good command of written English are nevertheless encouraged to submit articles in English in order to simplify the editorial process. All submissions will undergo a double blind peer review process by at least two reviewers. In the case of disparate opinions on the part of reviewers, the work will be forwarded to a third reviewer. Authors may be asked by the editors at all times during the editorial process to revise a contribution in order to maintain scientific standards and comply with the journal’s author guidelines and style guide. The editors may commission additional reviews as part of the editorial process. For authors who are requested by reviewers or editors to revise and resubmit their article it is mandatory to resubmit the article together with a documentation of the changes made according to the recommendations of reviewers or editors and to defend these changes. This statement will be provided to the reviewer together with the resubmitted article. Reviewers will receive all reviews in order to re-review resubmitted papers. Reviewers are expected to comply with the principles of good scientific conduct. Reviewers should not accept reviews if anonymity is breached or a conflict of interest exists. Review results will be made available to the authors anonymously. Decisions on the acceptance of papers, revision of contributions, additional reviews or re-reviews and copy editing are solely the responsibility of the editors in agreement with the publisher, and are final. By submitting a contribution, the corresponding author declares that the article has not been submitted or published previously, and that no copyright-protected material is used (unless by permission and properly acknowledged). Note that all submissions to our journal are screened by iThenticate (Professional Plagiarism Prevention) program.